Cuts, sometimes referred to as lacerations, are breaks or openings in the skin, typically caused by a sharp-edged instrument or object. Cuts can be superficial, affecting only the surface area of the skin, or deep, impacting muscles, tendons, ligaments, nerves, blood vessels and even bone. Puncture wounds are usually caused by pointed objects such as knives, nails or sharp teeth, as in an animal bite. If the skin surrounding the wound becomes red, swollen, warm and sore, or if the wound oozes pus (a greenish, yellow fluid), it may be infected and in need of medical care. If the skin is streaked red, this could indicate an infection of the lymph system, the system that drains fluid from the tissues. This type of infection, particularly when accompanied by a fever, can be serious and requires immediate medical attention. First, wash your hands to avoid infecting the area. It’s important to thoroughly clean the wound and the area surrounding it to avoid the risk of infection or tetanus. If you have a pair of disposable gloves, use them. Elevate the wound and apply direct pressure to stop bleeding. Clean and rinse the wound, and then clean around the wound with soap and water. Be careful to keep the soap out of the actual wound to avoid irritation. (If dirt still remains, try copious irrigation with water before heading to the nearest MD Now Urgent Care.) Stay away from irritating cleansers such as iodine or hydrogen peroxide. After cleansing, apply a thin layer of antibiotic cream or ointment such as Neosporin to keep the surface moist. This will discourage infection and encourage the body’s natural healing process. (If you develop a rash, discontinue use of the ointment.) For scratches and minor scrapes, leave the injury uncovered. For deeper wounds, cover the area to keep it clean and keep out harmful bacteria. Wash your hands to avoid infection. Rinse the puncture site under cool, running water for five minutes, before washing with soap. Carefully check to ensure there are no objects in the wound, being careful not to probe too deeply. Apply antibacterial ointment and a clean, nonstick bandage, before going to your nearest MD Now Urgent Care for further treatment. If any of the following applies, do not treat the wound on your own. 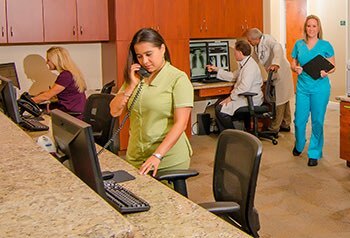 You should seek immediate medical care at the nearest MD Now Urgent Care. The wound is large or deep, regardless of whether bleeding is severe. The wound is more than a quarter inch deep, or reaches the bone. Stitches may be required. The wound is on the face or on a part of your body that is a concern for serious scarring. You have a hand or foot wound that limits function or movement. The wound is caused by a human or animal bite. Any cut or puncture caused by a fishhook, a nail, or any rusty object. An object or debris is stuck. Important: Do not remove the object yourself. The wound shows signs of infection such as warmth and redness, a sore or throbbing sensation, fever, swelling and/or pus-like drainage. You haven’t had a tetanus shot within the last 5-10 years. Deep laceration treatment should be left to the experienced medical professionals at your nearest MD Now Urgent Care. The first step is to stop the bleeding. You may be given medication to numb the area. Your wound will be thoroughly cleaned to avoid infection. Your doctor will assess the wound and determine the best way to repair it. For minor cuts, a special adhesive tape such as SteriStrips or tissue glue like Dermabond may be used to close the wound. Wounds that are missing skin, such as fingertip injuries, may need a special dressing with a material such as Gelfoam. 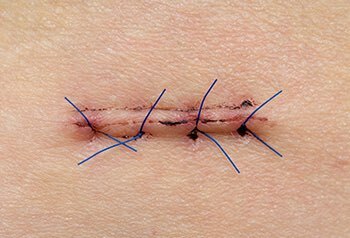 Deeper cuts may require interior, absorbable stitches in addition to exterior stitches. To stop bleeding, protect tissue and reduce scarring, stitches may be applied to the surface of the skin. A tetanus immunization may be needed if the wound is contaminated, and it has been longer than five years since your last immunization. If necessary, MD Now can help you get stitches fast. Your doctor will determine the need for stitches based on your particular wound. If necessary, the stitches will be applied at the time of your visit. Unless you have allergies to adhesives tapes, a minor cut may be treated with a product like SteriStrips or tissue glue like Dermabond or Indermil. Tissue glue provides a barrier against common bacterial microbes. Deeper cuts may require stitches to repair the fascia, the connective tissue envelope surrounding a muscle. Stitches may also be used to stop bleeding, protect the underlying tissue and reduce scarring. In cases with an increased risk of infection, or where bandage changing could prove difficult, your MD Now doctor may recommend a wound check after one to two days. 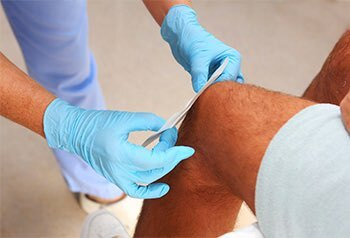 Removal of stitches is usually done at the MD Now Urgent Care office within 5 to 14 days, depending on the location of the stitches. Facial stitches: These may be removed after four to five days and usually no later than seven days. This is to prevent scarring and because healing occurs faster in this part of the body. Hand sutures: These may be left in for 14 days or longer due to slower healing and greater tension on the wound.